Sipromac vacuum packaging solutions ensure freshness and prolonged shelf life of your food products. 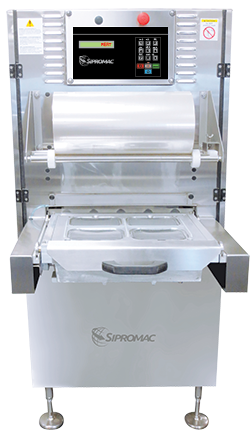 Sipromac has four models of tray sealers, one of which is a manual countertop model (TS-15) for sealing trays without modified atmosphere packaging. Two of the other models are automatic, and the last is semi-automatic. These Sipromac machines wrap each tray with plastic film, which can be up to 700 mm thick with model TS-70-3, and cut the film once the product is hermetically sealed. Tray sealer accessories may be changed quickly without special tools. The tray sealer is for food products and for industrial and medical supply packaging. These machines can be adapted to all tray sizes. Automatic tray sealers come with modified atmosphere packaging (MAP) to increases the product's shelf life, provides extra protection, prevents colouring. Heavy-duty, reliable stainless steel and easily dismantled components ensure the best possible maintenance processes. A Sipromac expert can help you choose the model that best meets your needs. Why use a tray sealer? Click on the link below to see the advantages of using a tray sealer in the food sector.